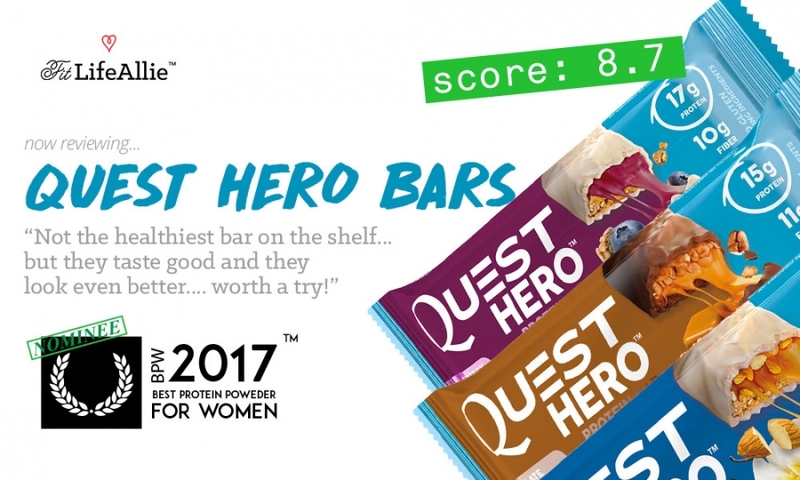 The new Quest Hero bar is here and it’s with great pleasure that I bring you what is sure to be one of my many viral reviews. Because these bars literally just launched. So you’re reading one of the world’s very FIRST Quest Hero Bar reviews. The company has launched the Hero bar as a sort of hybrid between the candy bar and the protein bar. They have created something that is quite delicious, and relatively healthy. But where does it stack up in the grand scheme of things? Is it as healthy as an Oatmega, or RXbar? Does it TASTE as good as a FitCrunch bar? And what’s the best flavor of the three new Quest Hero bar flavors, anyway? Pull up a chair and I’ll tell you in this incredible, brand-spanking-new, rock-n-rolling Quest Hero Bar review. Quest, Quest, Quest. The grandfather of the modern day protein snack bar. The OG. The original. The one we’ll tell our kids about. Speaking of kids. It’s interesting to note what Quest is doing here with the Hero bar. They clearly got together in their comfy Los Angeles offices, sat around the boardroom table playing googly-eyes at each other, and started throwing ideas around. The guy that decided to make Quest potato chips was fired long ago so he wasn’t there. The guy that made Quest protein powder said they should make a Quest pre workout and fat burner because he’s basic bill. The board room went silent. And then they made it. The new Quest Hero bar has more fun texture…more fun packaging…more fun flavors…and now I’m here to tell you that they’ve actually done a really nice job. Quest Hero bars taste pretty good. They are more fun to eat than the traditional ‘slab’ of clay that is the classic Quest bar. They have more dynamic textures that crunch, snap, pop, mush, and keep your taste buds happy. Without a DOUBT the chocolate caramel pecan. Eh. Actually. There WAS some doubt. Just a sliver of doubt. I thought that the Blueberry Cobbler, which was the first Quest Hero flavor that I tried, was also really good. It had the berry flavors that I really enjoy, but then also an outer, almost ‘yogurt-ey’ coating that I found to be so good. There is a good amount of blueberry flavor, and although it tastes just a little bit artificial to me, I’m able to suspend disbelief enough to really enjoy the flavors that they’ve come up in the Blueberry Cobbler Quest Hero bar. Chocolate Caramel Pecan has such depth, such intricacy to it’s flavor to go along with the fabulous texture in Quest Hero bars that I just couldn’t give it anything below the top spot. I actually don’t get very much PECAN flavor from this Quest Hero bar flavor, but it’s still remarkably good. I really like the caramel first of all. It hits you with big ‘Snickers’ notes right off the bat. The chocolate outer shell is fabulous and the crunchy-ness of the inside materials gives this flavor the perfect texture. Overall, Quest Hero bars taste better than regular Quest bars. And thus the million dollar question becomes…are Quest Hero bars actually healthy? Are Quest Hero Bars Healthy? Allulose. Hm. It doesn’t sound particularly appetizing, OR healthy. But Quest Hero bars use it as one of their sweeteners, along with sugar alcohol and sucralose. They seem to have actually built the Quest Hero bar marketing campaigns around this ‘allulose’ stuff. It’s apparently the new sweetener of the future. It’s all the rage. But what the heck even is it? I frankly don’t even care what it is or if it’s natural or unnatural. Because they just go and use sucralose and sugar and sugar alcohol anyways, lol. It’s classic Quest. Get them to look at the left hand while the right is performing the trick. That’s me at my most critical. I personally could give two cares what they sweeten this bar with. The whole world has gone crazy denouncing everything and anything that isn’t the most pure, grass-fed, free-range, gluten-free, vegan, non-gmo, blah, blah, blah BLAH. So Quest Hero uses artificial sweetener. And sugar. Get over it. One bite and 99% of people won’t care if there’s sucralose in here. Let’s look at the more important thing here.. what are the actual macros? Hm. So. It’s easy to see why they’ve been marketing the Quest Hero bar as a candy bar protein bar. It’s macros are not that great. There’s a good deal of saturated fat in here… and also a great deal of sugar. I don’t know. I don’t know if Quest Hero bars macros are going to be good enough to convince a health conscious millenial to buy their bar over a KIND bar (boring AF), an RXbar (which tastes awful), or a Square bar (which tastes awful). It’s the classic dilemma, as usual. Taste or health. Quest Hero bars have pretty wonderful taste, and rather unimpressive macros to be honest with you. Quest Hero Bars are some of the finest looking protein bars I’ve seen in a while. I’m never overly complimentary of Quest on their branding, but I’ll admit that the Hero bars are one of their finer efforts. These new Quest Hero bars have a beautiful, bold color palette…more playful graphics and design elements than their traditional bars…and overall a more appetizing aesthetic. I will give them an 87/100 on this latest packaging of the Quest Hero bar. So where does this all leave us? It leaves us here. Quest Protein Cookie Review: Are They ACTUALLY Good? Quest Protein Powder Review: Does it Taste as Good as the Bars?